This month you can begin a secret mission in Victorian-era Algiers, face a dark force on a storm-swept mountain, or confront the simple horror that is joining a new school. If tracking is more your thing, you can hunt down terrorist bombs and monstrous minions of a vampire, or seek out that fantastical hybrid, the ponycorn. Alternatively, you can enjoy time travel as either a teenager trapped in the 15th century or an autonomous testicle on a mission. 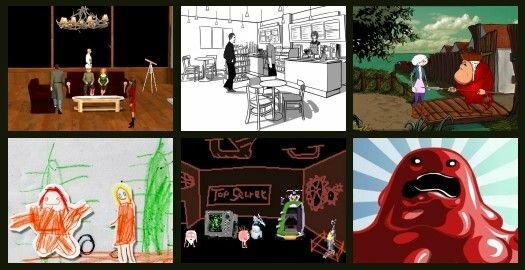 All these await you in this month’s roundup of new releases on the freeware scene. Jack Sinclair just wanted to have a spelunking holiday on Mount Shasta. Caught in a terrible storm as he enters the area, he stops to assist a broken-down car. Moments later, a third car crashes into the back of his, wrecking all three vehicles. With no means to go find help, the vehicles’ occupants reluctantly band together to seek shelter from the storm in a nearby abandoned cabin. But this is a cabin with an ill-starred history, and dark forces are abroad in the woods. With dawn a long nine hours away, will any of the stranded motorists live to see the sun rise? This game by Cogliostro is a dark tale in all senses of the word. The graphics are a detailed realistic depiction, with 3D models for all characters. When speaking, close-ups of the characters appear on-screen, with animated mouths and some use of expressions to convey emotion. The background noise in the outdoor scenes is largely provided by the sound of the storm, supplemented by sound effects where appropriate. Inside, the storm is replaced by music with a subtle ominous tone that adds to the creepy atmosphere. Control is handled by four-cursor point-and-click, each option incorporating a clear focus point. There is an action section, but failure offers the player the option to replay the sequence or skip past it. The game is split over nine chapters spent mostly controlling Jack, though three other characters become playable for one chapter each. This is not a game for the faint-hearted. Whilst the initial puzzles are simply about getting into the cabin and getting the electricity running, events take a more unpleasant turn before long, after which the horror tone sets in properly, with well-spaced blatant scares and a feeling of menace. The characters’ personalities are well-developed, from the mellowness of New Ageist Darcy to the much more unpleasant and cynical Sal. A notebook tracks your current main task but most of these require multiple steps involving exploration and use of inventory. Real effort has been made to integrate the puzzles with the story, adding greatly to the immersive feel. There are also several points in the story where different solutions are available, and how you act in these situations will determine which of the game’s three endings you get. Nine Hours to Dawn can be downloaded from the AGS website. Ponies are great. So are unicorns. But which is better? Whilst some might suggest a fight to determine the answer, there is a more peaceful solution. Why not combine the two to create a hybrid beast, the ponycorn? Surely such a combination would be even better. Such is the opinion of Sissy, who “friggin’ loves ponycorns” and sets out on a magical adventure to find some. Her path is not an easy one, as she travels via mystic rainbows and faces foes such as the evil lemon. But with a stable of ponycorns as the potential reward, Sissy will not be stopped. 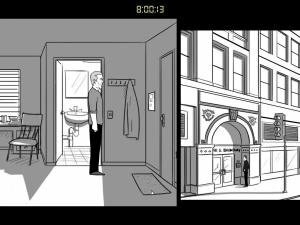 This point-and-click game from Untold Entertainment has an unusual background. Firstly, it was made as part of TOJam, a three-day independent game design challenge based in Toronto. More importantly, a large part of the design and content was created by five year-old Cassie Creighton. 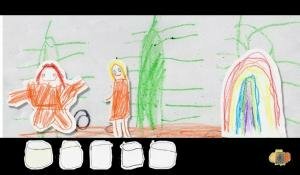 The graphics are her colourful and exuberant drawings, animated by having different versions of a drawing alternate on-screen or by having cut-outs of them move about. This does occasionally mean that items are not easily recognised, but there are no pixel hunts and clicking on objects always elicits a description. These descriptions, along with all the protagonist’s dialogue, are voiced with breathless enthusiasm by Cassie. Her voicework is supplemented by her father Ryan playing the other parts. In all cases the speech is clear, though the game also includes subtitles. The music is also Cassie’s, this time with the help of her sister, and fits well with the magical fantasy tone. This is undoubtedly not a difficult adventure, though anyone without the mind of a five year-old girl may sometimes struggle with the internal logic. Inventory items like keys are used automatically when appropriate to do so. The game is also fairly short, unsurprising given the short time it was created in. However, the real joy of this title is the escape into a world of child-like wonder. The surrealist situations and joyful enthusiasm of the voicework serve to make this a pleasant respite from the cares of adult life. The simple opening cutscene sets the light tone and the closing cinematic, with its “where are they now” descriptions for all the other characters, rounds off proceedings nicely. Those looking for deep plots and challenging puzzles will need to look elsewhere, but if you’re just looking for something to put a smile on your face, this could well do the trick. Sissy’s Magical Ponycorn Adventure can be played online at the developer’s website. The events depicted in the following paragraph take place in real time. Right now, terrorists are planning to plant a bomb in L.A., my mobile phone isn’t where I left it last night, and people I work with are waiting outside my building wondering what the heck is taking me so long. I’m player character Jake Brewer, and this is the most adventurous15 minutes of my life. This game from Tim Hengeveld won the April MAGS competition, and its similarities to a certain television series is most definitely not coincidental. The black-and-white art style is illustrated realism, with detailed line drawings supplemented by some grey shading. In keeping with its inspiration, the game incorporates split-screen panels to depict people in other locations when appropriate. Action in all panels is smoothly animated. The time pressure is maintained by an on-screen digital clock that starts at 08:00 and runs continuously during play. The background music also matches its inspiration, with tunes that would not be out of place in a television thriller. Control is fairly standard point-and-click, but during conversations you are presented with four choices of approach, with a separate timer prompting you to make your choice quickly. Whilst obviously made by a fan of 24, this is very much a parody of the series. The opening section includes an action never seen in the TV show, though its absence is regularly queried by fans. An unavoidable delay in gaining entry to the bomb location forces you to engage in small talk with your partner, with many tongue-in-cheek references to series events. This conversation also comically undermines the quick-choice dialogue system, with “Talk”, “Converse”, “Chat” and “Banter” as your options. The puzzles are fairly light, mostly revolving around locating and combining inventory in the first section and a simple bomb-disarming puzzle in the second section. As a result, the 15 minute time limit is unlikely to prove a problem for most players, but this sits well with the game’s light tone. 15 Minutes can be downloaded from the developer’s website. Nice one Steve! Haha, made me chuckle… But: “Apart from a nightclub scene there is no background music, as sound is limited to appropriate effects most of the time.”... Seriously? There’s 40 minutes of music in the game. Did you not set it up right? I was sure I had all the settings right, but if you say there is 40 minutes of music m0ds, I will take you at your word. I shall tinker with the settings and see if I can get it to play.